You'll dream of eating this macaroni and cheese! It is time to impart to you the wisdom of my macaroni and cheese. You must first realize that this recipe is the culmination of years of macaroni and cheese experimentation. As you may be aware, I take macaroni and cheese VERY seriously and often even have dreams where I'm eating creamy macaroni and cheese. I love those dreams! 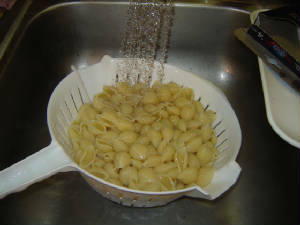 There are many schools of thought on how best to make macaroni and cheese and I know a lot of people who make a cheese sauce and pour it over macaroni and bake it. This is good but I find it generally is not cheesey enough. I have even seen recipes with eggs whipped in, and I am not of the school of thought that condones that. 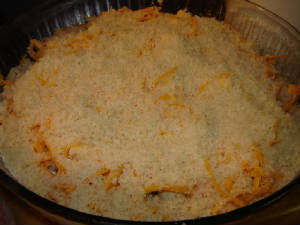 I have chosen the technique listed here as it is similar to the macaroni and cheese my mother raised me on, but I have added more cheese and refined it somewhat. The nice thing with this variation is that you end up with almost a cheese sauce type presentation without having to make the sauce and because of the layering, you get a lot of cheese in every bite. 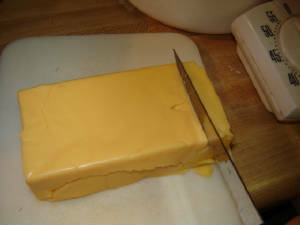 Make sure you bake it long enough that the cheese is very bubbly and it will all combine nicely. 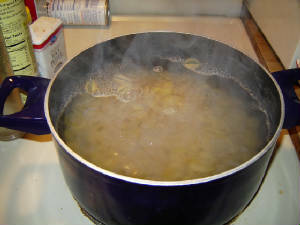 Boil your choice of macaroni shapes in a large pot of salted water. 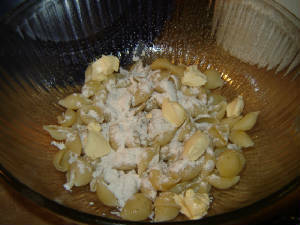 (Shown here: small shells). When tender but not overdone, drain and rinse with cold water. 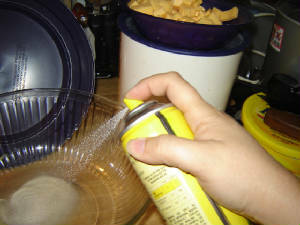 Spray non-stick oil spray in a large, deep oven safe bowl. 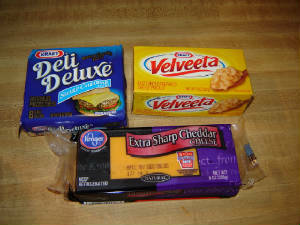 These are the 3 cheeses I like best (you can use your own preference). 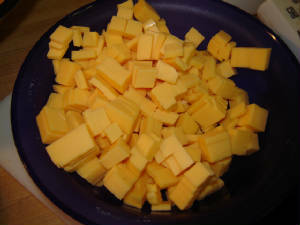 Velveeta is too soft to grate so dice it. 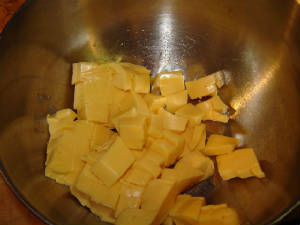 American cheese also doesn't grate well, so dice it also. Add a layer of macaroni & sprinkle with about a tbs. of flour, salt pepper and dot with butter. 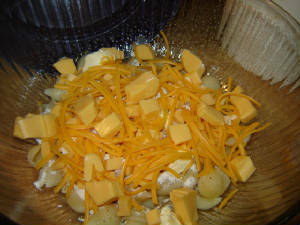 Scatter 1/3 of each type of cheese on top. 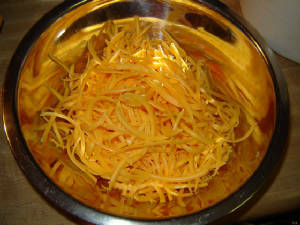 Repeat two more times with the most cheese on top layer. 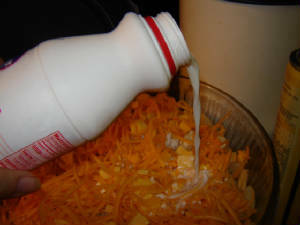 Once all the macaroni & cheese are layered, drizzle about 3/4 C. of milk over all. 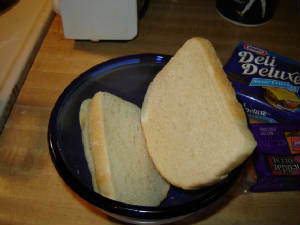 Crumb 2-3 pieces of bread -- enough to make about 1-2 C. of bread crumbs. 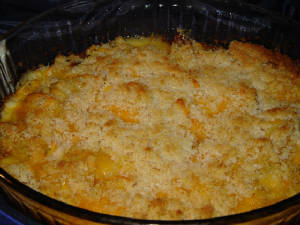 Spread crumbs all over the top (they'll keep the macaroni from drying out & add taste & appeal!